Running (or as I called it, jogging) was something I’d see people do early in the morning, quite often in dreadful weather conditions and I’d just think…why? What can you possibly gain from putting yourself through this, and by choice? That was until I started running. As with many of us in the running community, this was initially as an attempt to improve my mental well-being. There’s no doubt that for me, the benefits were almost immediate. A change in routine, combined with physical exercise, a sense of achievement and self worth were literally just what the doctor ordered. Now that I’d seen the light, I was happy to put myself through the pain of early morning weather-beaten runs. I’d been trying to build up distance on my runs (with music as my only running companion) and so decided I would enter my first race, the 2016 Stafford Half Marathon. The performance will never go down as my finest hour but it was enough for me to catch the racing bug! 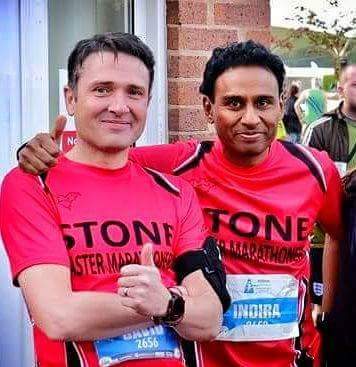 My sister, Kirsty Stephenson, a seasoned campaigner in the Staffordshire running scene, eventually persuaded me to join her club, The Stone Master Marathoners at the end of 2016. I’d been hesitant about joining a club for fear of being too slow or lacking long distance stamina. But the support, encouragement, training and most importantly, the banter provided by The Bats has been invaluable! By January 2017, talk at The Club had turned to who was going to be competing in something called Road Runners. 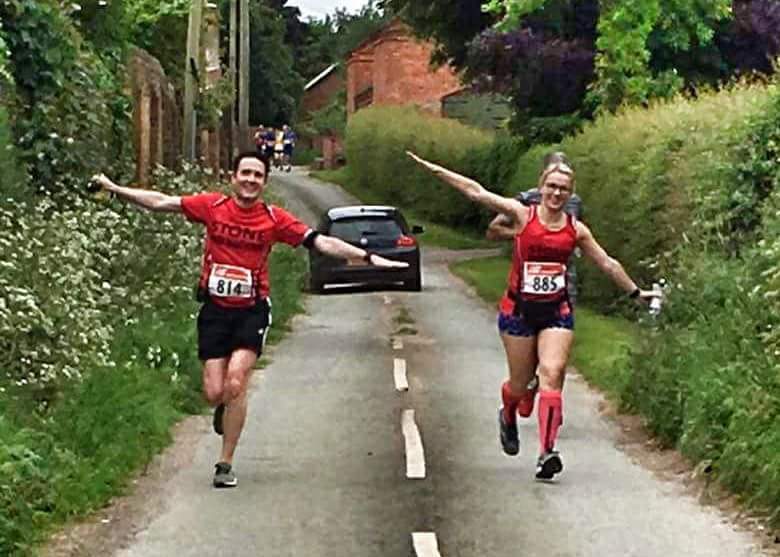 As a new member and a relatively new runner, I didn’t think this was something that concerned me and so contentedly waited for the next Stafford Half to come around (as far as I was aware, there were only a couple of local races – The Potters’ Arf, The Stafford Half and the St Michael’s 10k). Then, on a club training session, I spent a while speaking to Victoria Hughes about what exactly Road Runners was and whether it was something in which I should be competing. I didn’t have long to decide – the Alsager 5 was a week away and I figured I’d be better front loading the races to the first half of the year. And so it was, on a cold February morning, with my “E” firmly pinned to my back, I lined up with the other runners in Alsager ready for the off. Not only was this my first foray in to the world of NSRRA, it was also my first race for The Club. I chatted nervously with Fiona Bradley (who was also running her first race as a Bat) while trying to identify other runners in our groups. Thirty six minutes later and I’d crossed the line, 48 points the richer. Celebrating the start of the NSRRA season with my fellow Bats in the pub, I was thinking “1 down, 11 to go!” My intention was to pick 12 races and just see how I got on with those – this being my first year, I just wanted to find my feet. With that in mind, I entered the Knighton 20 and Newcastle 10k. I didn’t have “a great day at the office” on either of these, but was still happy to pick up a couple of 49s. Next up, The South Cheshire 10k – a nice, flat PB course. Such was my love for The Bats, I‘d been toying with getting inked with the Stone Master Marathoner’s distinctive bat logo and decided that I would only do this if and when I achieved a group win. As I crossed the finish line, I was handed a group winner’s mug and so didn’t have to wait to find out if the 50 points were mine. Over the moon with the group win and a PB, I headed to Raymondo’s tattoo parlour to get my bat-tat / battoo – short of an appearance on Tattoo Fixers, I was now a Bat for life! It wasn’t until later in the week that I discovered my good friend and fellow Bat, Indira, who had finished just ahead of me, had quite rightly been promoted to group E and so my precious 50 points became 49 and the tattoo should never have been! A family holiday in North Wales had meant the Uttoxeter Half was never going to be one of my 12. 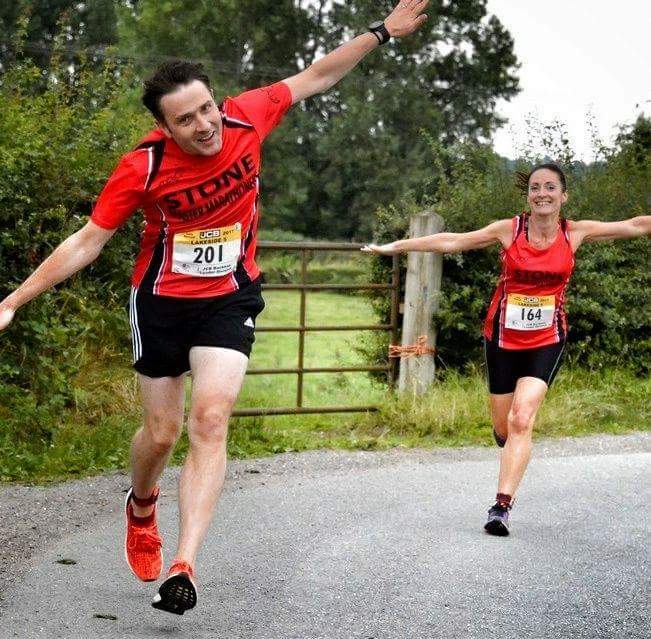 As I trained in the rain around the foot of Snowdonia, race withdrawal symptoms kicked in and I was resigned to missing out on the 13.1 miles, the Bats’ banter and the celebrations at Uttoxeter. So when Katie, my incredibly understanding wife (and I mean above and beyond all levels of understanding), suggested we leave two days early as a result of the inclement weather (in North Wales? Never! ), I had the car packed and ready to go before you could say Llanfair¬pwllgwyngyll¬gogery¬chwyrn¬drobwll¬llan¬tysilio¬gogo¬goch! Boy, was I glad I never missed this one! The course was stunning, challenging but very rewarding and I finally got the 50 points that in my mind, justified being inked. Five down, seven to go. Even after completing the Clayton 10k a few weeks later, I still had no intention of running more than 12 races. Next in the series was the Flying Fox Marathon and I was nowhere near ready to take on a challenge like that so decided this would be one of the races I’d drop. That was until Bernie Priekulis, The Bats’ team captain and race organiser, started parading the finishers’ medals on Facebook and so it was that race 7 was entered. I knew the risk of running a marathon without training properly – Westbridge 5 and Potters’ Arf were in the following weeks and I would be putting my fitness for those races in jeopardy. Blinded by the beauty and promise of that medal, I set off nonetheless. Accompanied by Aggi Pope, the first 18 miles flew by but the lack of training and fitness soon took their toll and as Aggi disappeared off in to the distance, I inevitably hit The Wall. I’d never DNF’d before, but this was looking more and more likely. However, with the support of the amazing Bat marshals and fellow runners, I finally crossed the line in 4 hours 2 minutes and gained another 49 points. I dare say that this will be perceived as being more than slightly biased, but from start to finish, this was undoubtedly the finest race in which I’ve competed – not in terms of my own performance, but the atmosphere, camaraderie, support, celebrations, organisation were all second to none. To top it all, fellow Bat Paul Swan had finished first male. Time would tell what damage I’d done. Despite managing a recovery run and some hill work, I was putting on a brave face. I appreciate that marathons should be treated with respect but what was done was done and it’s not a mistake I will make again. I did manage a 35 minute PB at Westbridge 5 the following week, but had one of my worst performances to date at the Potters’ Arf – nothing felt right, physically or mentally and I found myself barely able to walk up Heartbreak Hill, never mind run. Indira, whose speed and stamina seemed to be improving exponentially, had been picking up the 50 points in all of the recent races and this continued through to The St Michaels 10k and The Cheadle 4 – always seemingly just in front of me, I could never find the strength to catch him when required. After a weekend of running through mud and torrential rain at Thunder Run 24 in July, it was back to NSRRA. While away, Indira and I had been examining the points situation and we’d worked out that if he won the next two races, the group was his. With this in mind and full of grit, steely determination and TR24 mud still clinging to my legs, I proceeded to finish second to Indira yet again at the Staffs Knot 5. I was still happy with being the runner up in the group, especially to such a good friend and fellow Bat. This was my first year in NSRRA and I would learn from the mistakes I’d made and push to improve next year. So, onward to Meerkbrook 15k and I finally felt the pressure was off. I still had an outside chance of winning the group but it would mean taking 50 points in all of the remaining 8 races. Given Indira’s current form, I didn’t fancy my chances. As I’d discovered with all of Mick Hall’s races, he loves his hills and Meerbrook is no different. Since joining the Bats, I’d learned to embrace the hills as a necessary evil and as the season had progressed, I found myself able to tackle them with greater conviction and speed (I’ve got John Clemens to thank for this!). For the first 8 or so kilometres, the race went the way of the previous few – me chasing Indira before he got so far ahead that there would be no chance of catching him. As the steep inclines took their inevitable toll on my calves, I felt the energy drain from my legs and with it, the last chance of winning the group. I’d pushed myself to collapsing exhaustion over the finish line of every previous race and so I was still proud of what I’d achieved and that I’d run to the best of my ability. In the distance, I could still just about see Indira who seemed to be slowing slightly – had the hills hit him harder than they’d hit me? There was one long steep downhill on the course before the finish and so I convinced myself if I managed to catch up before then, I might still have a chance. Luckily for me, this is exactly what happened – as steep as the inclines were, the down hills were magnificent. I’m pretty fearless on descents and so managed to get far enough ahead to cross the line and claim my second group winners’ mug and the 50 points. Ecstatic as I was to have kept the group alive, I soon realised that I still had to repeat this 7 times, all the while aware that just one more win for my friend and it was all over. I was now going to have to complete all 20 races and the initial 12 race plan was well and truly out the window. With this glimmer of hope, I pushed myself harder and harder in the next few races, managing group wins at The Trentham 10k, The Leek Half and The South Cheshire 20. Fortunately for me, these are undulating, country road courses with some fantastic descents – my kind of race! Lining up at the start of The Ipstones 5, I was eager to keep up the momentum I’d gained from the previous races, but from the off, I could tell that Indira meant business. As we rounded the top of the field, I could see that he was the lead runner. There was no point in trying to chase him at this stage, I just had to have confidence in my race plan – tackle the inclines strongly and then play to my strengths by sprinting on the descents to the point whereby one false step and I’d be a goner. Thankfully, the risks were rewarded and another group win was in the bag. 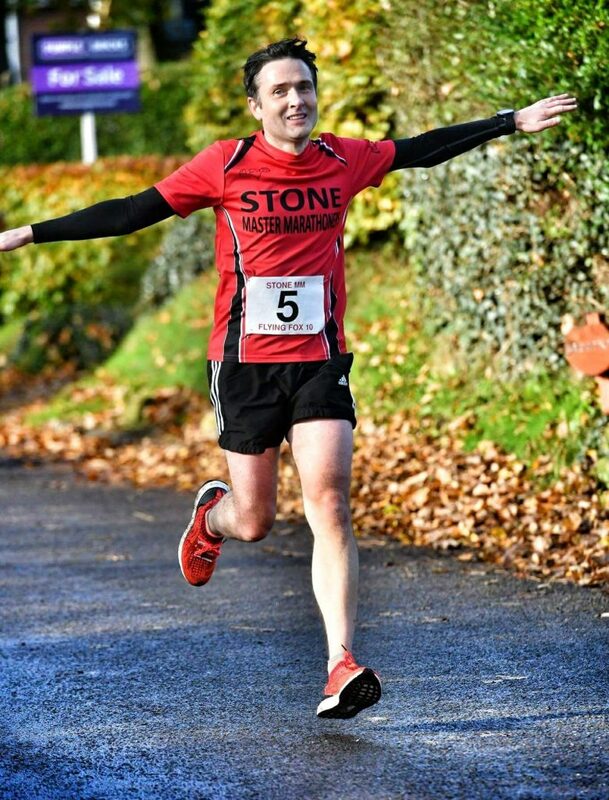 I carried on with this same winning strategy through The St Thomas 7 and Congleton Half Marathon – both wonderful courses that really suited my style of racing. I’m not going to lie – by now I was thinking I did have a chance of pulling the group back. The only niggle was that being Scottish, we’re not famed for comebacks – more often than not, we’re grabbing defeat from the jaws of victory! Going in to the last two races, it was all square in the group. Unlike other recent races, Indira and I ran The Werrington 10k together and by the 9th kilometre, it was still anyone’s race. Over the tannoy system, I could hear Ken Rushton announcing the finishers as they crossed the line, a comforting indication that the end was just around the corner. As I sprinted back through the school grounds towards the finish, I was aware of chasing feet pounding behind me. However, when I allowed myself a brief glance over my shoulder, Indira was nowhere to be seen. Fiona finished shortly after me and said she’d passed him on the last ascent, so we waited at the finish line for our friend to appear. What we didn’t expect was the chilling sight of a severely exhausted and dehydrated Indira being held up by Paul Glover and Vince Coyne as they supported him down the home straight. As the medics attended to him, it was a relief to see he was still adequately compos mentis to stop his Garmin – runners’ priorities! Thankfully, Indira recovered sufficiently to return to the race HQ at the school where he was plied with cake, Lucozade and sweet tea while being attended to by Nurse Bradley. Needless to say, Paul and Vince sacrificing their races to help a fellow runner in his time of need is undoubtedly one of the most heart warming, endearing and selfless acts of the year. You did yourselves and the running community proud guys! I do hope Indira doesn’t mind me writing about this, but it was such a pivotal part of my season. Seeing my friend suffering in that way was as much a wake up call as it was distressing. We’d been running, supporting and pushing each other throughout the year, but through points and PB chasing, I’d missed the bigger picture – this is supposed to be fun! 19 down, 1 to go. I am writing this the day before the Flying Fox 10. I was going to finish the report on the Sunday afternoon after the race, but there is no need – it really doesn’t matter about the result and who won the group. I still get emotional when I think about what I have taken from my first year as a runner, a Bat and being part of the NSRRA community. Putting aside becoming a running bore, it has undoubtedly changed me for the better – both my physical and mental health got a much needed shot in the arm (maybe not the best metaphor in the context!). I also forged what I consider to be some of the most important friendships of my life and their support, encouragement and ability to listen to me wittering on about the highs and lows of every race while still feigning interest is very much appreciated! My only regret? The fact that I never ran The Rugeley 10 – so close to it being 23 out of 23! Next year.